When you Saved a Report on the Reports Page, you could include all or some athletes in the report by selecting them using the Athletes Selection pop up box. However, only the athletes selected at the time the report was saved would appear when the report was loaded next. When the Saved Report was loaded, it did not include any new athletes added into that group. Because new athletes were not automatically included, you had to tick the new athlete and save the report again. 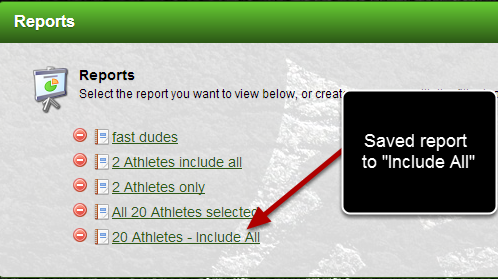 Now, you can select to automatically include all new athletes when you are saving a report (see the steps below). Now when you select to Save a Report you will be asked if you want to save it to include only the specific "No. Athletes", or to "Include All"
-To Save the Report for only the selected athletes (regardless if new athletes are added to this group) select the "No. Athletes" (e.g. 20 Athletes) option. This means ONLY the 20 athletes and no other users will appear in this report when you run it for the group you created it for. -To Save the Report to INCLUDE any new athletes that are added to the group click on "Include All". This will mean that all of the current athletes in the group and any NEW athletes will appear in the report each time it is run (as shown in the image below). This is the original report that was Saved in the first step of this lesson. At the time there were only 20 athletes in the group, but the report was set up to Include All. This means if any new athletes are added, they will be included in the report when it is loaded (as shown in the image in the step below). 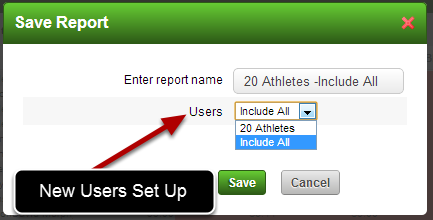 When Include All is selected any new athletes added to the group are automatically included in the Report. 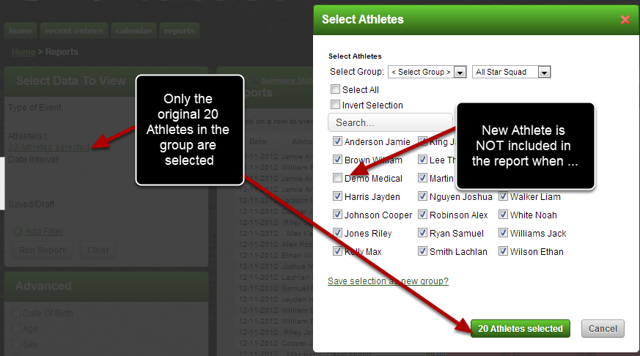 Zoom: When Include All is selected any new athletes added to the group are automatically included in the Report. If you only want to include specific athletes from a group in a report, then select the athletes and when you save the report, ensure you select the "2 Athletes" option. This will save the report for these two athletes only. If you selected to "Include All', even though you had only originally selected two athletes, ALL of the athletes in the group would be included in the report when it was next run. Please consider the exact work flow you require for your reports. If you have any questions or concerns then contact your distributor or type a comment below.